YWCA chapters across the country hold Stand Against Racism events, and yesterday I attended one focused on the intersection of racism and domestic violence. I was particularly interested in this topic because, as we’ve reported many times on this blog, domestic violence is a leading cause of family homelessness. While domestic violence plagues people of all races and socio-economic classes, women of color are more likely than white women to be victims. These higher rates of violence can be linked to racism, sexism, poverty and unemployment, and distrust of the legal system. These rates should also be placed within a broader socio-historical context — one that continues to limit the potential of black people through implicit and explicit racism. So it is not ‘race’ that predicts violence, but poverty, opportunity, socio-historical context and — for black women — an understandable distrust of the legal system. 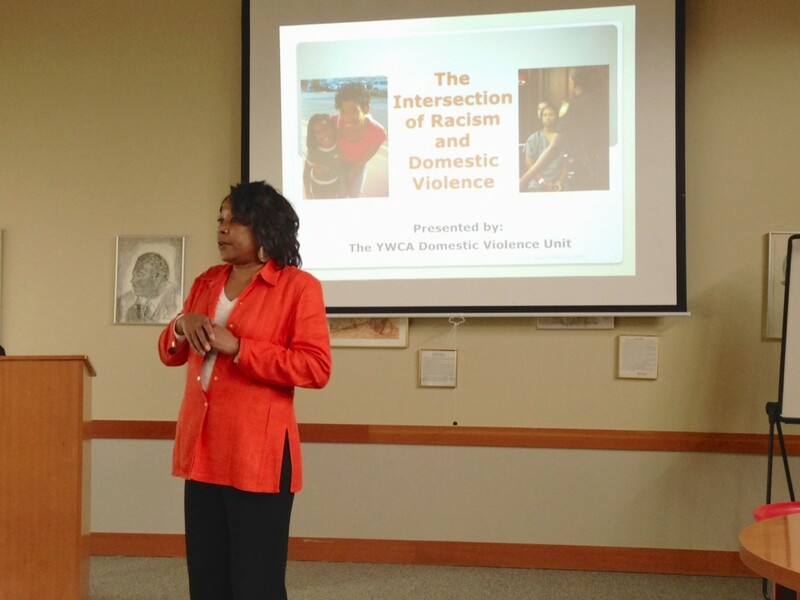 In yesterday’s presentation, the Domestic Violence Unit of YWCA Seattle | King | Snohomish provided insight as to why women of color, and black women in particular, are less likely than white women to report domestic violence and connect with support services. Many of the reasons are outlined in this helpful fact sheet from the Women of Color Network. Okesia Phillips facilitates a weekly support group for African-American survivors of domestic violence. She once asked the women why they were reluctant to report domestic violence to police, and wrote their responses on a poster. Of the wide variety of responses, one stood out to me: The women feared being blamed for the domestic violence situation. The historic stereotype of the white woman is that she is small, delicate, soft, passive… The African-American woman, however, is not small, delicate, soft, or passive… Being viewed as the “strong black woman” is positive, but unfortunately, it leaves African-American women in caregiver roles with no opportunities when they need care. Therefore, the African-American woman must first demonstrate herself to be a victim in general, and then a victim of domestic violence… The problem of not recognizing African-American women as victims as immediately as white women impedes their ability to utilize resources, and may put the African-American victim in a more imminent position of danger. Doris O’Neal, who manages the YWCA’s domestic violence program, said that her staff will often help black survivors of domestic violence develop a safety plan just for calling the police. They tell the women to “calm yourself down. Don’t be aggressive. Be respectful.” Doris explained. Otherwise, because of pervasive stereotypes about black women, police might mistake the victims for the aggressors and fail to intervene appropriately. The prosecution of Marissa Alexander, a domestic violence survivor who fired a warning shot in self defense, sparked protests. Image from USPrisonCulture.com. The YWCA’s domestic violence advocates are doing great work to help survivors connect with culturally appropriate services and begin to heal. They’re also training police and other authorities to respond effectively and compassionately to domestic violence calls. Their important contributions are just one part of the solution. I have not lived with domestic violence, and I don’t know what it’s like to move through the world as a person of color. What I do know is that when a woman does not achieve her full potential because she lives with domestic violence, and when children are traumatized by growing up in violent households, it affects all of us. And we all have a responsibility to address violence and racism in our systems and societies. 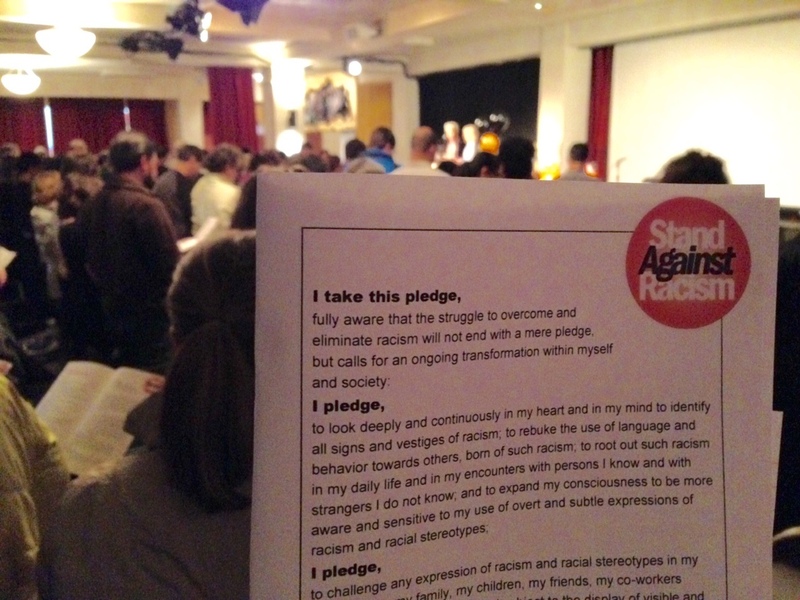 I joined thousands of people across the country in taking the National Pledge Against Racism today. Before learning about the link between stereotypes and domestic violence survivors’ access to services, I might have considered this a valuable, but not necessarily life-changing, section of the pledge. Now I know that perpetuating stereotypes can mean the difference between life and death. Take the National Pledge Against Racism. Talk about this topic with members of your community. If you’re in the Seattle area, you can join the monthly discussion group Having the Conversation: Discussing Racism, Privilege and Oppression. Visit the group’s Facebook page, or email facilitator Kyeisha Hodge at kyeisha.hodge@gmail.com. Educate yourself about how to help someone who is experiencing domestic violence. Listen, show empathy, and don’t judge. Learn more on the National Domestic Violence Hotline website.